An M2.8 class flare erupted from Sunspot AR1865 at 9:48 p.m. EDT (0148 GMT on Oct. 9) in this still image taken from a video by NASA's Solar Dynamics Observatory. 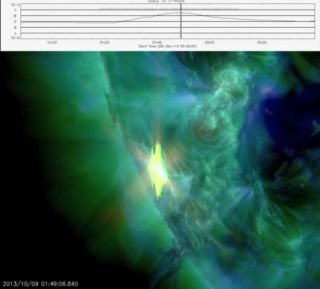 The strongest solar flare in nearly two months erupted from the sun Tuesday (Oct. 8), causing a minor geomagnetic storm as charged particles from the sun passed by the planet. Follow Denise Chow on Twitter @denisechow. Follow us @Spacedotcom, Facebook and Google+. Original article on SPACE.com.